Cooking with a wok is one of the simplest ways of making delicious food. Its versatility is unparalleled - it can be used for stir-frying, braising, steaming and deep-frying. Factor in the speed with which most wok dishes can be cooked and you have the perfect kitchen tool. This fantastic new volume brings together the best of wok cooking. 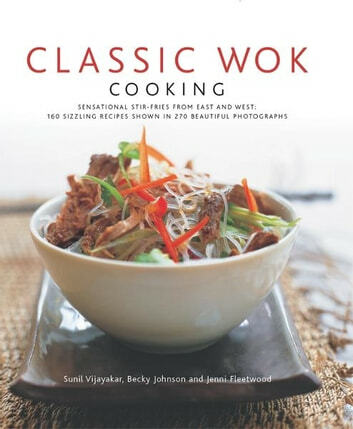 Whether you want Chinese Crispy Five-Spice Chicken, Crisp-Fried Japanese Panko Prawns, Malaysian Laksa Lemak or Indian Mee Goreng this book has 160 sizzling recipes to suit every palate and occasion. Fresh, bright and contemporary, 270 stunning photos illustrate the chapters on Crispy Snacks and Finger Food, Soups and Appetizers, Poultry Dishes, Meat Dishes, Seafood and Fish, Vegetarian Main Dishes, Vegetables and Side Dishes, and Sweet Dishes and Desserts. A guide to the essential equipment, cooking techniques and ingredients then follows, taking you from stir-frying and smoking to steaming rice and noodles, and explaining how to use and prepare ingredients, from tofu and meat to spices and sauces.